(4.7-Inch For iPhone 6, 6S, Samsung Galaxy S3/S4, iPhone 5/5C/5S) ---- (5.5-Inch For iPhone 6 Plus, 6S Plus, Samsung Galaxy S7 Edge/S6/S5, Note 4/5) TOUCH SCREEN COMPATIBLE: Enjoy the full use of your iPhone 6 6S through the protective screen cover on the armband with fully touch compatible, easily answer calls, manage your playlist, or activate your stopwatch without removing the phone. ENVIRONMENTALLY FRIENDLY: Our Armband is SGS Approved. Join the Green Side! Eco Friendly. SIZING & COMPATIBILITY: Double Adjustable Velcro Armband Will Fit Almost Any Arm Size Up To 16". 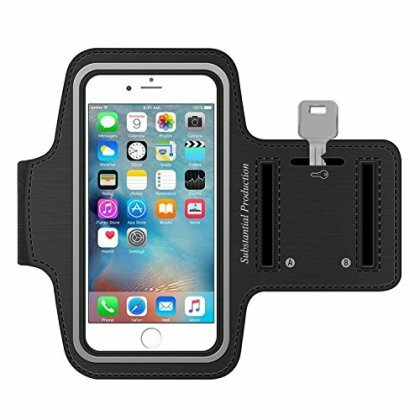 Our Armband Will Fit Perfectly The Apple iPhone SE, 6/6S (4.7"), 5/5s/5c, Samsung S4, S3, S2, HTC, With Headphone Support For Most All Phones. As Well As Any Phone That Has A Screen Up To 5.2". QUALITY MATERIALS: Our Armband Is Made Of The Highest Quality Soft Neoprene That Is Made To Flex, Twist, And Bend But Not Stretch Out Of Shape. It Can Stand Up To The Toughest Of Workouts And Marathons. Our Armband Is Ultra Light Weight (1.4oz) For Speed And Comfort During All Activities. Our Armband Offers Full Screen Coverage Yet You Will Retain Full Touch Screen Functionality, Along With Full Headphone Jack Support For Apple And Android Phones. BONUS FEATURES: Our Armband Includes A Reflective Strip For Safe Running In Low Light Conditions. ★ SECURE Built-in Hidden Key Holder, Perfect For House/Car Keys! Never Worry About Having To Carry Your Keys In Your Pocket Or Losing Them At The Gym.